At first, video signals from a CCTV camera was set to be carried by coaxial cables, which lasted for many years, until about 20 years ago, when an American company had the brilliant idea of ​​using UTP (Unshielded Twisted Pair) category 5e cables (4 pairs) to carry video signal of up to 4 cameras via a single cable! Yes, the idea seemed to be good but it had a problem: Coaxial cables are 75 ohms impedance and UTP cables, 100 ohms. This impedance mismatch could cause return loss (to know what is return loss, read this article here). With a impedance matching balun. Baluns convert the 75 ohms impedance of a coaxial cable (camera output and DVR input) in the 100 ohms impedance of an UTP cable. Therefore, NEVER USE BALUNS WITH COAX CABLES. Just because they don't need, they already have a 75 ohms impedance. The role of ground mesh of a coaxial cable is to provide a shielding against interference, with the video signal flowing in the central conductor. The opposite is also true: Shielding also prevents signals carried trough the cable from forming an external magnetic field, which would cause interference in other nearby cables or equipment. But how to protect an unshielded cable from interference? The twisted pair cable consists of pairs of wires twisted with each other in order to cancel the electromagnetic interference (EMI). This technique was invented in 1881 by Alexander Graham Bell, the inventor of the telephone, when he realized that twisting the transmission lines on the poles helped to eliminate interference. But how is possible to eliminate interference by simply braiding the pairs ? In a coaxial cable, the 2 means transmitting the signal are different. One is the center conductor and the other is the mesh that surrounds it. We call this an unbalanced cable. In an UTP cable, the 2 cables transmitting the signal are identical and twisted together. We call this a balanced cable. Which is the advantage of using a balanced cable? In a balanced cable, signal is also balanced. It is divided into 2 equal parts, one of which is sent inverted. For example a video signal of 1 volt peak-to-peak at the output of a camera is divided into 2 parts: A 0.5 Vpp exiting the + terminal of the balun and the other half is inverted, being with - 0.5 Vpp , which leaves the - terminal of the balun. The balun + terminal is connected to the darker color of a twisted pair. The balun - terminal is connected to the light-colored cable (or striped, or white) of a twisted pair. The advantage of this is that the electromagnetic fields formed by the two signals that run through the pair, being of inverted polarity, cancel itself, forming a shield which prevents the cable from causing interference to other nearby cables or equipment. Besides that, due to the cable being braided, any interference or external noise will reach the two signals with the same intensity. Upon arriving at the other end, the negative half of the signal is again inverted and added to the positive half being the signal back to 1 Vpp . As the negative half of the noise is also inverted with the video signal, when the two halves of the signal are added, noise is canceled. That is, the reversal polarity signal of the two halves forms a shield against external interference. It's then explained how the use of baluns for twisted pair cables can form a shielding similar to that of a coaxial cable . As explained in 7 things you need to know about power supplies for CCTV, the unwanted ground loop effect occurs when there is a difference of potential between the ground reference of a camera and a DVR . However, as the twisted pair takes only two balanced signals, there is no path to ground between the two baluns. So as it doesn't close a loop, there is no place to the ground loop effect on an unshielded twisted pair cable. Do not use shielded twisted pair cable! Video baluns were designed to be used with UTP cables, or unshielded cables. Therefore, don't use FTP, STP or any other type of shielded twisted pair cable with video baluns. Simply because the cable shielding will form a dirt road between the camera and the DVR, closing the loop, which will allow the occurrence of an undesirable ground loop effect. But, if by chance you have to use a shielded twisted pair cable, connect just one side of the shield to the ground (DVR or camera side) , not both , to avoid creating a loop. Also never leave the shield disconnected from both sides. Without a grounding point shield will act as a deflector for the magnetic field formed in the cable, extending its reach, which can cause interference with nearby cable or equipment . As noted above, any noise picked up by the cable is canceled when one half of the signal is again inverted to be added to the other half. At camera's side when video signal passes through the first balun, it's divided into two equal halves, with reference to the ground of the BNC connector in the input balun. At the other end , when the signals are added again , it's taken as a reference ground the BNC connector of output balun . The problem is that if the ground of the two sides aren't at the same potential, noise will not be fully canceled. In the example below, there is a difference of 0.1 V between the grounds of camera and DVR. Thus, to a shielding against interference of a twisted pair cabling with baluns function properly, ground reference of two ends must be at the same potential. So it is extremely important to use a centralized power supply to ensure that camera and DVR are in the same ground potential. When baluns for CCTV were invented , more than 15 years ago, horizontal resolution of most cameras was about 330 HTVL, occupying a bandwidth of only 4.13 MHz . However, when the horizontal resolution of video cameras began to increase, the required bandwidth increased proportionally . For example, for a 420 HTVL camera it is necessary a 5.25 MHz bandwidth; for 600 HTVL , 7.5 MHz . The problem is that this increasing of resolution meets physical limitations of the baluns . In the second and third lines, it is informed that the frequency response is 0-6 MHz for a maximum distance of 300m. At most a 6 MHz bandwidth? So baluns liabilities will cut any resolution above 480 HTVL! ​ This means that if you intend to make a CCTV installation with passive baluns and twisted pair cable, there is no reason using cameras with resolutions higher than 480 HTVL because any resolution above that will be filtered by baluns. But does this limitation only occurs with these Chinese baluns or are they all like this? To clarify this question, I sought the specifications of an American balun manufactured by the company that invented these baluns for CCTV. - In green, for a resolution of 600 HTVL, only 30 m! - In yellow, for a distance of 300 m, only 235 TV lines of resolution! That is, for higher resolution cameras , you can not use UTP cables with passive baluns for long distances. When this kind of balun was invented, it was Ok as the resolution of the best image sensors was no more than 480 HTVL. - For 600 HTVL, 300 m.
- For 800 HTVL, about 150 m.
How an active balun corrects the loss at high frequencies? In passive baluns, losses due to the electrical resistance in the cable attenuates the level of the video signal. In addition, higher frequencies suffer greater attenuation due to the capacitive effect of the cable and the limitations of the balun itself. When we put an active balun at the reception, the video signal level are equalized, that is, the level of higher frequencies suffer greater amplification than the lower frequencies, causing the signal being back to the same level across the frequency spectrum. I was wondering if this distance and resolution limitations for passive baluns was really that critical. So I picked up a pair of that Chinese passive baluns, exactly those of the above specification and tested them for the frequencies from 0 to 10 MHz (up to 800 HTVL ) with 100 , 200 and 300 m of a good quality UTP CAT 5e cable, composed by rigid wires of pure copper . NEVER USE PASSIVE BALUNS FOR DISTANCES ABOVE 100 M! In tests with an active receiver balun I could get a 800 HTVL resolution with up to 350 m UTP cable. As each UTP CAT 5e cable has 4 pairs, you can also send power to the camera via UTP cables. In this case , you can not send signals from up to 4 cameras via a single cable. It will be needed one UTP cable for each camera. - Joins the 2 wires of brown pair to connect the positive of power supply. As each wire has a 24 AWG gauge, joining a pair to carry the power will double the wire gauge ( 2 x 24 AWG), and thus achieving twice the distance. 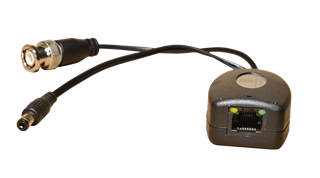 In this case , it uses a special balun and a RJ-45 connector on the UTP cable. For a camera that consumes 300 mA as one with a 30 m IR, power can go only up to 47 m away. It seems too little, but it is the correct calculation, as it takes into account the specifications of camera manufacturers, which stipulate that a camera must be powered with 12 V plus or minus 10 %, ie from 10.8 to 13.2 V.
Therefore , cameras should not be supplied with voltages lower than 10.8 V. Below this voltage camera's life may be compromised and their characteristics such as signal-to-noise ratio, resolution, sensitivity, etc., can be affected. This calculation will be explained in the next article in this series, which will be about power cabling. ​TIP: Two cameras video signals + power on the same UTP cable If you have two cameras installed very close, on the same pole, for example, you can receive the video signal and feed these two cameras with a single UTP cable.Just use the orange pair, which was vacant, for the video signal from the second camera .The problem is that you will need to make an adjustment, using 2 pairs of video baluns (no power) and make the power connection manually . Another problem is that as now two cameras are being fed, you must add the current consumption of these 2 cameras to determine the maximum distance allowed.For example, for 2 identical cameras that consume 300 mA each, the maximum distance will be halved. Instead of 47 m, it will be only 23.5 m .
You can extend these distances sending supply voltages higher than 12 Volts and using tension reducers video baluns at the other end . The only problem is that I haven't seen so far any of these sets of power + video baluns using active baluns, only passive ones. UTP video baluns use various types of connection: Pressure terminals , screw terminals and even RJ-45 connectors. Problem is that none of these connection types is suitable for outdoor use, as they are not immune to moisture or dust. Whereas about 80 % of the calls for service are related to cabling problems (bad contact, broken connections, etc. ), it is highly recommended to accommodate baluns that are installed outdoors in enclosures with IP 66 protection. HD analog cameras, of HD-CVI, HD-TVI and AHD echnologyies, use a much higher bandwidth than the 10 MHz used by a 800 HTVL resolution of an analog camera. Depending on the technology, required bandwidth can exceed 50 MHz. Therefore, it is necessary to use HD baluns, which are specially designed for these technologies. They are more expensive than conventional passive baluns and maximum distance reached is about 200 m.
Up to now , there aren't active baluns for these HD technologies, only passive. The use of UTP cables with baluns to send video signals is an alternative to coaxial cables. You cannot say that one solution is better than the other; it will depend on the application, the distances involved, etc. The important thing is to weigh all the variables involved (cost of each solution, infrastructure conditions, etc.) to choose the most appropriate solution for each situation, the one with the best cost / benefit.